Last time, I discussed midpoints as the simplest case of a planetary picture. By showing a factor standing in a given midpoint, (I used Mars/Jupiter=Sun as our example) we could easily see that the focus of the structure was the Sun standing midway between Mars and Jupiter. When there is a point to focus upon, it is easy to see the expression of energies. Occupied midpoints would therefore seem to be very powerful. Unoccupied midpoints work this way: If Mars/Jupiter means “successful activity” and it is unoccupied, then, for the most part, one wouldn’t experience spreading success. Yet, in life, we all (even those who do not have a natal connection between Mars and Jupiter) go through periods where we do our personal best, and where we are recognized for our successes. Other times, we might find that the work we do for a company turns into a superior project that brings recognition. In this case there may be something in the synastry between the native’s Mars/Jupiter axis and a factor in the horoscope of the company. And we all have experienced relationships that have brought out the best in us. All too often we hear people attributing their success to another’s presence in their lives. I concluded my previous article showing how the Part of Fortune is yet another example of midpoint application. In the structure of the Part of Fortune, there is no object at the focus of the primary midpoint. Instead, the Part of Fortune itself completes a shared midpoint axis. As the ancients observed in using the Part of Fortune, multiple midpoints that share a common axis can become powerful indicators of events and the expression of life. Further on in this article, we will apply our ideas about midpoints to the “ingress” chart of the Winter Solstice. An ingress horoscope, a chart for the moment a factor enters a new sign or other specific point in the sky, is one of the oldest techniques in astrology. The ancients spent a lot of time and energy figuring out just when the Sun would cross the cusps of the four cardinal signs (zero degrees Aries, Cancer, Libra and Capricorn). Interpreting the cardinal ingress horoscopes would yield information about the coming quarter or year for the world in general. Casting the ingress chart for a specific place (yielding a local Ascendant and MC) would give information about general conditions at that location. 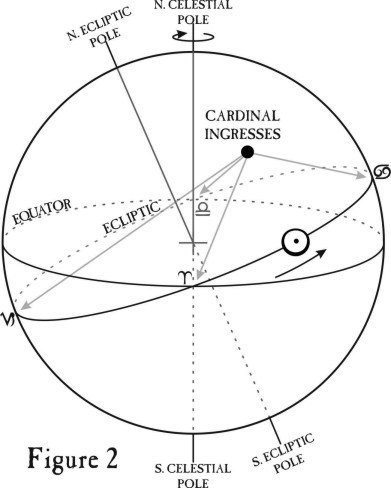 The Sun’s ingresses into the cardinal signs were considered more important than other sign ingresses because the cardinal ingresses mark four critical points in the Sun’s annual cycle. These points are the winter and summer solstices, and the spring and autumn equinoxes. They arise from the interplay of the equator (the plane of the Earth’s daily rotation) and the ecliptic (the plane of the Earth’s annual orbit of the Sun -- which from Earth appears to be the path of the Sun’s travel). The equator and the ecliptic are inclined to each other by about 23 1/2 degrees. The equinoxes are where the two planes intersect, and the solstices are where the planes are furthest apart. The spring equinox occurs when the Sun crosses into Aries. At that point the Sun is crossing the plane of the equator moving north. The Sun rises and sets due west all over the world, and the days and nights are of equal length. When the Sun has traveled as far north as possible, it arrives at zero Cancer. This marks the summer solstice. Here the plane of the ecliptic is at its maximum distance north of the equator, and the day is at its maximum length. After this point, the Sun starts rising and setting further south each day, and the day length starts to decrease. Eventually, the Sun once more rises and sets due west all over the world, and the days are again of equal length. This time, however, the Sun is crossing the plane of the equator headed south, and the day length is decreasing. This is the autumn equinox, when the Sun is at zero Libra. The Sun continues to rise and set further and further south each day, and the day length continues to decrease. Eventually we arrive at the winter solstice, the shortest day of the year, when the Sun enters Capricorn. Zero Capricorn is the place where the ecliptic is at its furthest point south of the equator. From that point, the Sun starts to rise and set further and further north again, the days start getting longer, and a new yearly cycle begins. We can compare this movement of the year to the movement of the day. The daily cycle of the Sun’s rising and setting is also caused by the intersection of two planes. This time it is the intersection of the ecliptic, or path of the Sun’s apparent travel, with the plane of the horizon. The astronomical horizon is a plane that runs through the Earth’s center and is perpendicular to the line that runs from the zenith (the point directly over your head) to the nadir (the point directly beneath you on the other side of the Earth). The Sun’s movement into Aries can be compared to sunrise, when the Sun, which is always located on the ecliptic, is carried by the Earth’s daily rotation to the horizon. Here, the Sun is at the Ascendant, moving upward. The Sun’s ingress into Cancer is comparable to noon, when the Sun reaches the MC and is high in the sky shining its brightest. Its entrance into Libra is like sunset, when the Sun has reached the Descendant and is crossing the horizon headed down. The Capricorn ingress can be likened to midnight, when the Sun is at the IC and darkness prevails. Here, once more, we see the day likened to the year -- a central astrological concept which also gives rise to day-for-a-year progressions and solar arc directions. The interplay of the equator and the ecliptic gives rise to some interesting metaphysical symbolism. As the plane of the Earth’s daily rotation, the equator represents the body of the Earth, and this is expressed through the poles of the Earth, which lie perpendicular to the equator. The Earth’s poles are analogous to the zenith/nadir axis of a horoscope, which lies perpendicular to the horizon. The Earth’s poles stand for the Earth itself, and the equator, like the horizon, is where the action takes place. Without the help of the Sun, the Earth would be a lifeless rock -- in other words, pure matter. The ecliptic, the plane of the earth’s yearly orbit around the Sun, is the expression of the Sun -- pure life and spirit with no matter. The interplay of the ecliptic and equator thus becomes the material expression of life itself -- a living form, spirit manifest in matter. In other words, it is the Earth’s movement around the Sun that makes it a living body. All the beings and forms inhabiting the Earth become an expression of a global living body that nowadays we call Gaia. In the case of the Sun’s ingress into the cardinal signs, it is the entry into Capricorn that is the strongest and most important. This is because the Capricorn ingress is the bottom, or start, of the yearly cycle -- the “midnight” of the year. The winter solstice was the time of the year when the ancient astrologer-priests really earned their pay. It was the time of the longest night, of maximum darkness, and it was marked by fear, trembling and sacrifice. If the Sun didn’t start to move northward, woe be to us all! As soon as ancient astrologers saw that the Sun was starting to rise and set further north and to ride higher in the sky, it was evident that life would go on. After the “death” of the Sun came the rebirth, and celebrations ensued. The job of ancient astrologers was to mark this change -- as evidenced in the Roman festival of Saturnalia. For these reasons, the winter solstice chart is taken to forecast the entire coming year. The other three cardinal ingresses are used to get further information about the development of the yearly solar cycle, and are used to predict the coming quarter. Another concept familiar to knowledgeable ancients was the interpretation of the cardinal sign cusps as belonging to the generality. In other words, when the cardinal axis (zero Capricorn, Cancer, Aries and Libra) is placed into a horoscope and it is found in prominent places, it connects the native to the world in some way. For example, if you had Saturn conjunct one of the cardinal points, you would be fearful of the world and would have to work hard for worldly recognition on a positive level. If you had Jupiter conjunct one of the cardinal points, you would see the world as a place of opportunity. Your easily gained recognition would be taken for granted, and the world would seem to you like a basket of fruit ripe for the taking. In times when most folks didn’t travel more than ten miles from the birthplace, the cardinal axis wouldn’t have been very useful in delineation. In those days the Ascendant would have been more helpful, because it shows our connection to our immediate environment. An ancient astrologer would have used the condition of the Ascendant to see whether or not the native was prominent locally. Modern times present a very different view, and nowadays the cardinal axis is a very “personal point” showing our connection to a growing world consciousness. Another concept related to the cardinal points is that of “antiscia.” The term antiscion means a shadow-image or mirror-like reflection. 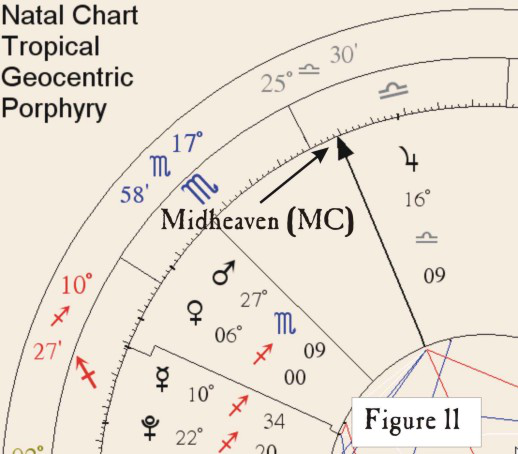 The antiscion of a planet is its “shadow-image” on the other side of the Cancer-Capricorn axis, equidistant from that axis. A planet also has a contra-antiscion -- its shadow-image the same number of degrees on the other side of the Aries-Libra axis. Thus zero Cancer and Capricorn are at the midpoint of every point and its antiscion, and zero Aries and Libra are at the midpoint of every point and its contra-antiscion. Antiscia aren’t simply midpoint configurations, however, They are also rough indicators of declination. It wasn’t until the early 18th century that parallels began being measured precisely. 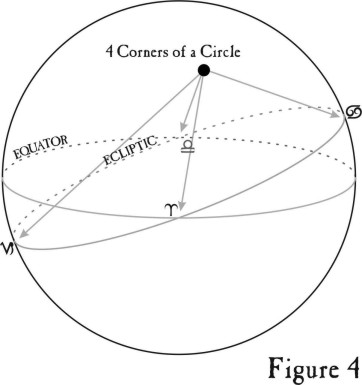 Prior to that, astrologers used antiscia to approximate parallels, and contra-antiscia to approximate contra-parallels. As you may remember, declination measures the distance of a planet north or south of the Earth’s equator. The cycle of the Sun’s changing declination during the course of a year gives rise to our seasons, and also defines the twelve signs of the tropical zodiac. When the Sun is at 0° Aries or Libra, its declination is 0°. This is because these are the points where the Sun’s path, the ecliptic, crosses the equator. When the Sun is at 0° Capricorn, its declination is approximately 23½° south, and when it is at 0° Cancer, its declination is approximately 23½° north. As we said above, these are the points where the Sun reaches its maximum distance from the equator. Now we get to antiscia: When the Sun crosses 15° Taurus or 15° Leo, its declination is 16°20’ north -- in other words, these two points that are equidistant from 0° Cancer are antiscia of each other. If we are talking about the Sun or any other point that lies exactly on the ecliptic, the points would be exactly parallel. Similarly, 15° of Aquarius and Scorpio are antiscia of each other, except that in this case their declination is 16°20’ south. Another example: If the Sun is at 2° Gemini (declination = 20°33’ north) and Mars is at 28° Cancer, they are antiscia each other. This means that they are also creating a midpoint axis with 0° Cancer-Capricorn at the focus. In other words, we have the completed planetary picture Sun/Mars = Cancer-Capricorn. As we said above, the cardinal axis connects to the world. The meaning could be violent or could have to do with the general working conditions (depending upon what else is in our fictional axis). If, on the other hand, Mars stood at 28° Capricorn, then Mars and the 2° Gemini Sun would be in contra-antiscion and roughly contra-parallel. They would also be making a planetary picture with the cardinal axis, this time its Aries-Libra arm. 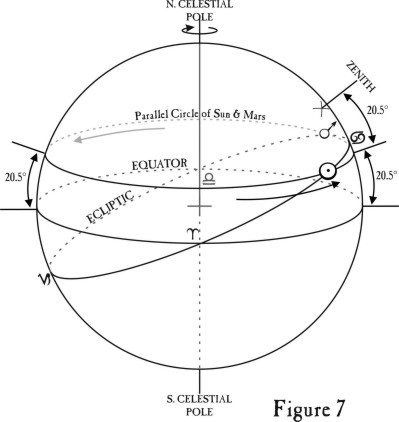 We say “roughly contra-parallel” because while the Sun is by definition always on the ecliptic, the other planets, including Mars, have orbits slightly inclined to the ecliptic. They are only exactly on the ecliptic twice during their orbital cycle, when their orbital plane crosses the plane of the ecliptic. Therefore, while planets that are exactly antiscion or contra-antiscion each other are usually within orb of being parallel or contra-parallel each other, they are seldom exactly so. Why were antiscia and contra-antiscia so important to the ancients? This is a very physical thing. Let’s use our example from the last paragraph, with the Sun at 2° Gemini and a declination of 20°33’ and with Mars at 28° Cancer, its declination is roughly the same. If you go to 20°33’ north latitude on the earth, during the course of the day both Mars and the Sun will transit your zenith (the point directly over where you are on earth). This they will do even though they may not be connected by any conventional aspect. 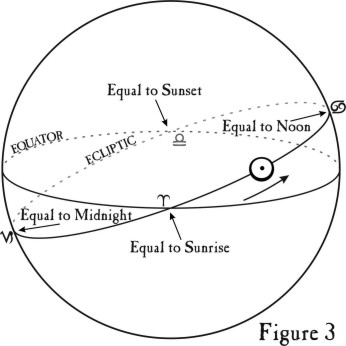 As the Earth rotates each day, all planets and stars move in parallel to the equator, and those at the same declination (distance from the equator) share the same diurnal band in the sky. If you were born at 20°33’ north latitude on earth, 20°33’ north declination would be very important in your horoscope. If you were born at 41°06’ north latitude (2 x 20°33’ = 41°06’), the midpoint of your zenith (your personal pole) and the equator (the plane of the Earth’s rotation) would be occupied by both Mars and the Sun. Or, if you were born at 20°33’ south latitude, then the equator would stand at the midpoint of your zenith and Mars-Sun. All of these examples are very powerful symmetries tying places to the world through planetary energies. These kinds of combinations are called “planetary pictures in declination” and represent symmetry in the vertical plane. While we will come back to antiscia and declination in more detail, for now we will treat these structures as very powerful pictures in the horoscope. The 2004 Winter Solstice occurs on December 21, 2004 at 12:41 pm UT. To illustrate the USA’s role in the world at this time, the charts illustrated here are set up for Washington, DC. I have included a conventional chart with houses above, and on the next page the same chart drawn on a 360° dial. Since I assume that most of you are already familiar with the standard form, I will mainly be using the dial and explaining things from a dial point of view. While a standard form is useful for determining things like the most elevated planet, factors that are angular, and aspects to the angles, a dial enables us to see symmetrical patterns very clearly. 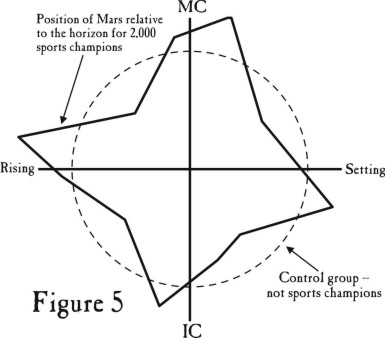 Entering planetary positions on the dial is simple. On the dial the signs are 30° as usual, and they run counterclockwise around the circle in the usual way. Looking at the standard chart wheel, you will see that the MC (the darker line with an arrow) is in Libra at 25°30’. 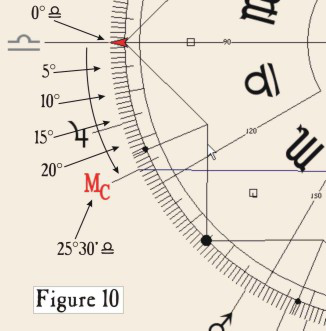 Now look at the dial and find Libra, count 25½ ticks counterclockwise from the Virgo-Libra cusp, and you will see the MC on the dial. All the factors are entered on the dial in this way. In the standard chart wheel, if you look at the MC your eye is trained to see factors that aspect it. 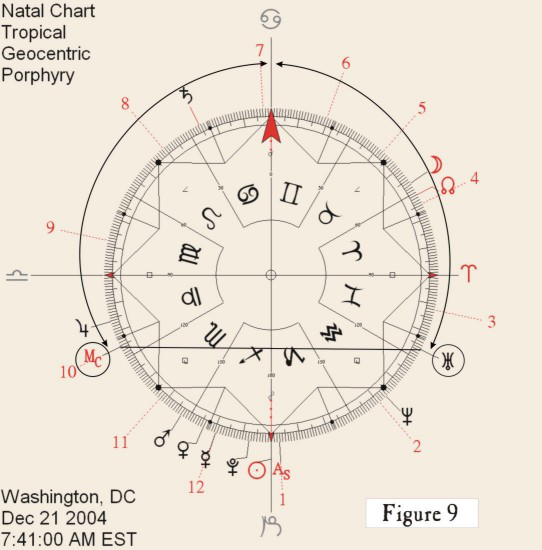 You would note that in this chart erected for Washington, DC, Saturn, in the 7th house, is square the MC. This is very important information, illustrating the USA’s difficulties with, and isolation from, its partners in the world. It also indicates that the USA will be depressed and stoic, and will have to take great care in executing the responsibilities that it has incurred. However, this isn’t the whole story concerning this configuration. There are things that we can’t see in the standard form -- things that we will see if we use a dial. 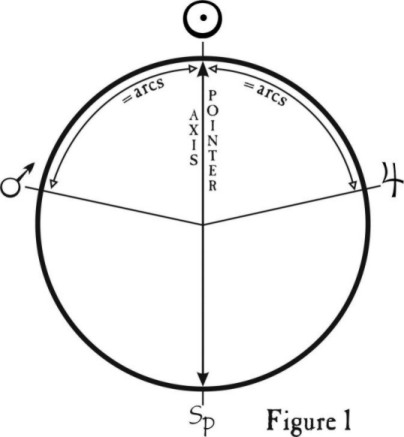 If you look at the dial illustration in Figure 9 above, you will note a line connecting Uranus to the MC. This line means that the midpoint of the MC and Uranus equals the Cancer-Capricorn axis. If you count down from Cancer to the MC, and then count down from Cancer to Uranus, you will find that the distances are roughly equal (115½° plus or minus 1°). This means that the MC and Uranus are roughly antiscions of each other and therefore are parallel. (In actual declination, the MC is at 9°51’ South and Uranus is at 10°54’ South.) As well as finding their expression through the MC, these two points also find their expression through the Sun, which at a solstice always resides exactly on the cardinal axis. Seeing this configuration on the dial changes our interpretation of the MC dramatically. The MC can be interpreted as the USA and the actions it takes, and Uranus as independent actions. Since MC/Uranus equals the Cardinal Axis and the Sun, it finds expression in the world. Saturn when connected to Uranus rules great tension, alienation, earthquakes, stress, shaking, and black-and-white choices (no greys). 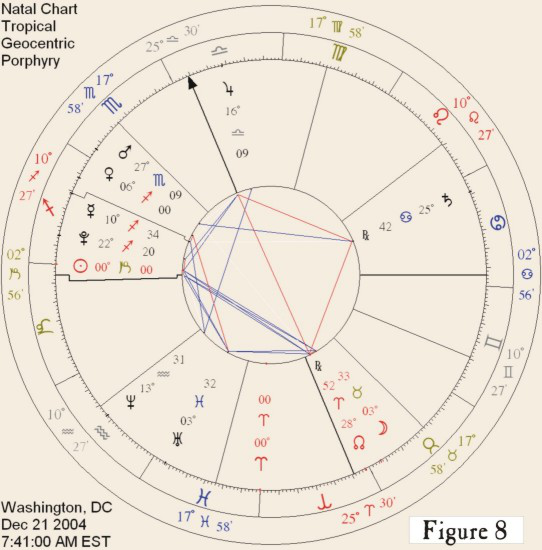 Thus, the MC with the Sun and Uranus shows that the USA will be acting autocratically and independently in the world. Coupled with the Saturn square to the MC, this is a setup for stress, sudden alienation, and drastic actions that will affect the USA for a long time afterward. We see that the actions of the USA can cause great world tensions. Also that the USA will be experiencing literally Earth-shattering experiences, like earthquakes and other natural problems. However, the USA can be an innovator and lead the world to amazing things, but only if it takes great care in making choices and doesn’t shoot from the hip. I have used the MC-Uranus configuration illustrate how to refine your readings by using symmetry and antiscia. However, this is only one axis among many in this interesting chart.